A typical progression of allergic diseases begins with eczema in early life. 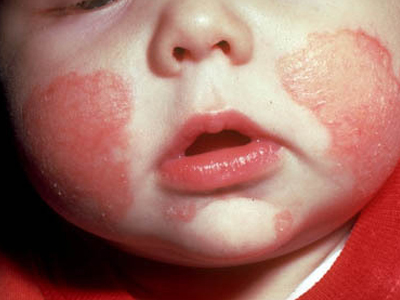 Atopic dermatitis, also known as eczema, is a chronic skin condition that causes recurrent episodes of itchy red rashes. It often begins in the first years of life and is often an indication that the child will develop other allergic diseases such as asthma, allergic rhinitis or food allergies. Symptoms of eczema include patches of red skin, itching and dry cracked or scaly skin especially inside the folds of the elbows and knees. Allergy testing can be helpful to identify the triggers. Treatment includes good skin care, prevention of scratching and avoidance of known triggers such as pet dander, dust mite or food. Bleach baths are now part of the standard regimen for eczema as they decrease inflammation and prevent skin superinfection by bacteria. Medicated non-steroidal creams can also be used as prevention.